Specially formulated leads give a clear, fine line on fabrics. Lines are easily removed from most fabrics with the special Sewline Eraser or removed by dabbing with a damp cloth or washing. AVAILABLE IN: WHITE, BLACK, PINK, GREEN. Straw Needles are hand applique needles by Jeana Kimball. AVAILABLE IN SIZES: 8, 9, 10, AND 11. As many of you are discovering, Terial Magic allows you to play with single ply fabric in a whole new way. It replaces stabilizers and fusibles as backings for quilters and embroiderers, keeps fraying in check for scrapbookers and crafters and gives the fabric a firmer hand for holding shapes and folds for all fabric projects. The HandiQuilter Wave A Template is used to make 12" wave designs that are 1" or 2" deep. The HandiQuilter Wave B Template is used to make 10" wave designs that are 1" or 2" deep. 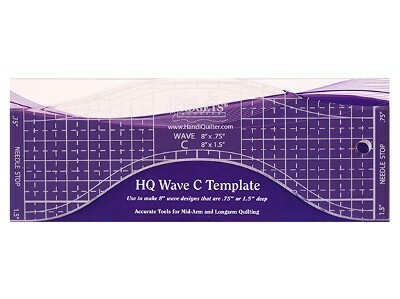 The HandiQuilter Wave C Template is to make 8" wave designs. It can be used with any brand mid-arm or longarm quilting machine. The HandiQuilter Wave F Template is used to make 4" wave designs .75" or 1.5" deep.